These chocolate chunk cookies are so simple to make and decidedly less involved than many gluten-free baking recipes. They bake up thin, crispy, and perfectly chewy. These cookies contain no flour or starches, which means they are lower in carbohydrates and, since they are made with cashew butter, are loaded with protein. And, should you choose to use dark chocolate, they’re also dairy-free. As always, be vigilant and check labels — especially when purchasing chocolate, as some contain wheat and gluten. Craving something yummy? Try these four gluten-free cookie recipes this weekend! These gingersnaps are full of flavor. They’re chewy, moist, and have a crackly top, as any gingersnap should. If you don’t like your gingersnaps chewy, no worries, just bake them a bit longer and they’ll crisp up perfectly! Gosh, those cookies were good. Rrr… I mean it was a great bonding experience. Gluten Free Recipe: Yabba Dabba Do Cookies! (I’ve also made them with the cocoa pebbles and both are awesome!). Before making these I called Post to double-check that these two cereals were in fact gluten-free and was assured that they were gluten-free. Try them today. You’ll love them! These light (and no, not in the fat content sense), buttery, sweet little wafers will melt in your mouth. Plus, shortbread is perfect for making gluten free because it’s supposed to be a little crumbly. I don’t even bother making wheat shortbread cookies anymore because everyone likes these just as much, if not more. Head over to our Recipes section and check out all the Gluten-Free Cookie Recipes! I tend to over think blogging so my intent is to be short and sweet (good luck to me). 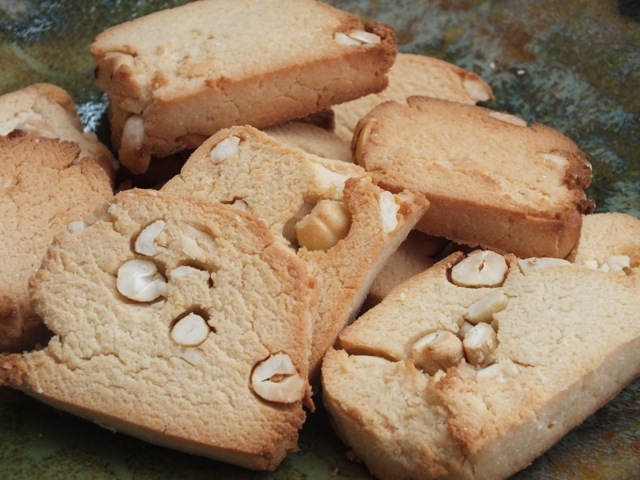 Many years ago, I had a recipe for Lemon Almond Cookies. I had copied it from a magazine (specifically from Gourmet, Feb 1990) and kept it all of these years. It is hand written on a recipe card; I added my own interpretation and instructions. At Christmas, I always made these delicious, sweet and crisp cookies. What makes these gluten-free cookies so good? They are moist and delicious and taste like brownies! But what really sets this recipe apart is the small amount of flour, sugar and butter called for, especially compared to most cookie recipes. Based on a recipe for “Chocolate Truffle Cookies with Sea Salt” from Ghirardelli Chocolates, our recipe calls for a healthy measure of chopped walnuts and we’ve omitted the additional sea salt called for in Ghirardelli’s original recipe.